I read Dan Pink’s books Free-Agent Nation and a Whole New Mind and became a fan of his work. 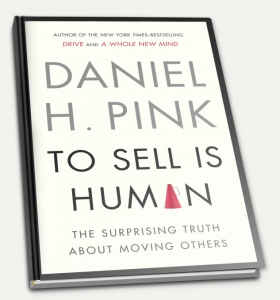 Dan Pink’s books have been bestsellers, so when I found out he had a new book coming out: “To Sell is Human”, I immediately pre-ordered his book on Amazon. Then Dan Pink announced in his newsletter that he was looking for members for his launch team, I put my application in right away and I got accepted! I’m so excited! Sales is all around us, and even if you think you aren’t in sales, you are using sales skills every day: to get your point across, to make your child eat their food, or to get someone to understand where you are coming from. Dan’s book is about sales, but not just for sales people. This is a book for people that want to get others to buy into what you believe and want to get accomplished. According to Dan, sales has been changed more over the last ten years than it had in the 100 years before that. I especially notice that in working with our clients in the automotive industry, where we work with auto dealerships to implement social media. People want to buy from people they know (and use social media to accomplish that), but car dealers have a hard time changing from how they used to work to what works now. Auto dealerships are definitely not the only ones struggling with the new way of doing sales; if I only look internally within my company, I notice that sales is not the first thing on our want-to-do-list either. Sales is 1-on-1, sales is not marketing. Marketing is what we love, sales is what we have to do to get to do more marketing. 🙂 So I can’t wait to read the book, get inspired and implement his suggested strategies! A free 20-page PDF workbook, based on To Sell is Human, giving you a two-week plan to get better at selling and a head start on those who won’t have the book until January. A free New Year’s Day webinar – with an exclusive look at the ideas, people, and publications I’ll be watching in 2013 along with a chance to ask me questions. A free customized Field Notes memo book – my favorite notebook of all time, printed in a (very) limited edition batch commemorating publication of the book. A free To Sell is Human bookplate, signed and numbered, to put inside your book. A free audio download of a one-hour special edition of Office Hours (not available anywhere else) featuring exclusive interviews with Robert Cialdini, author of the classic book, Influence and Adam Grant, the Wharton professor whose not-yet-published study is one of the biggest pieces of news in To Sell is Human. You also get the goodies if you buy an ebook (Kindle). When you pre-order the book, or if you’ve done so already, forward your receipt to danpinkpreorder@gmail.com. They will verify it and send you instructions on how to access your goodies when they are ready. Disclaimer: Dan Pink & his team are providing me with a free copy of his book, and the goodies listed above. I don’t get paid for writing this review, and am free to write a positive or negative review. I have to agree that sales have changed tremendously. Most people struggle just with the concept of selling something, let alone the concept of selling “without selling” in the way that we are seeing now. Congratulations on joining the team and I’ve added this book to my list! Thanks for sharing. Good recommendation, got my attention. And yes, sales is changing faster than ever. Hiring, training, evaluating, and managing sales people is so different than even 5 years ago, and older managers struggle with this. “Selling Without Selling” I do believe is a gift that has transended time. Some very established salespeople have done it for years. I remember reading one book called “of influence” which said that its natural to be a salesman. some people are born into it, others mold themselves. I cannot stand sales, but it is a necessary evil. Perhaps this book will help me find ways to reduce the ick factor.